The World Federation of Exchanges has released guidelines for ESG-related metrics that companies should release to investors. 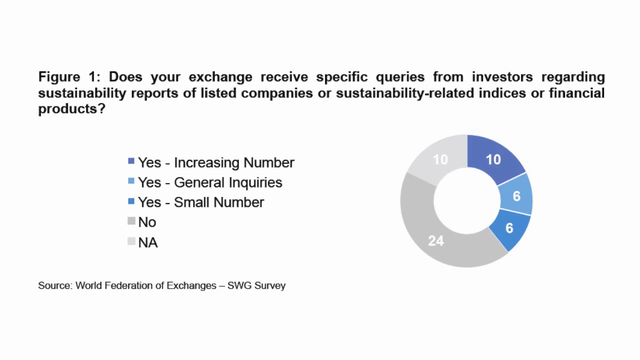 Companies listed on the WFE’s 64 global exchanges are being urged to report on 30-plus metrics to guide investment decision-making. The guidelines also encourage companies to use standardized reporting frameworks. The WFE represents over 44,000 companies with a total market capitalization of $64 trillion and a trading value of $76 trillion, equal to more than 75 percent of global GDP. Driving this move is the growing number of large investors who are asking for more reliable and more comparable information material to the bottom line. Also requesting more disclosure are the reporting frameworks that many companies already deal with, such as the Global Reporting Initiative, Sustainability Accounting Standards Board, and the International Integrated Reporting Council. NASDAQ is chair of the WFE’s Sustainability Working Group, and will be offering an end-of-the-year update in a webinar on the state of stock exchange developments, as well as a look at global sustainability trends as outlined by the World Business Council on Sustainable Development. I’m John Howell for 3BL Media.